One week a year geek enthusiasts get together to celebrate a passion that we all share. Administrators, Engineers, Bloggers, Executives and Employees converge on one city ready to learn about the latest in virtualization technology from VMware and its partners. All 23,000 of us. This year VMworld 2016 was held at Mandalay Bay in Las Vegas, NV. Instead of writing about the news of the conference, Im going to recap my VMworld 2016. Hopefully you will get a different perspective than the normal Day 1, Day 2 summary. This was my second VMworld. The first one I attended was way back in 2007, and it was held in San Francisco, CA. What a difference I experienced from almost ten years ago. In 2007 I attended the conference by myself and I was with a smaller company. This time up, the company I work for is a TAM (Technical Account Manager) customer, and is also a much larger company and that meant more vendor parties! Yeah! There was six of us going this year, two VMware Engineers, one VDI Engineer, one Network Engineer and two Ops folks, one of which is a VP. Most of us flew out on Saturday so we could check in at registration a day early and be able to attend the TAM Customer Day on Sunday. I had never been to a TAM Customer Day before, and I was really impressed. The day was filled with a morning Key note and a great discussion with Pat Gelsinger (CEO VMware) and Michael Dell (CEO of Dell Technologies). The afternoon session was a really great CTO panel discussion with Paul Strong, Chris Wolf, Kit Colbert, Shawn Bass and Christos Karamanolis. We had a great lunch and then were able to meet and talk to a number of VMware experts on every technical topic you can imagine. After TAM Customer Day we were able to check out the opening of the Solutions Exchange and the reception party. The solutions exchange didn’t disappoint. It was packed to the brim with many vendors and they were all looking to exchange your badge scan for some swag! I scored a number of t-shirts and all sorts of items, like pens, headphones, battery chargers and a couple Google Cardboard VR. There were a few vendors giving out some nice stuff for being a VMware vExpert. Cohesity gave us a great Timbuk2 backpack filled with a Contigo water bottle, a battery charger, a USB drive and some connectors. 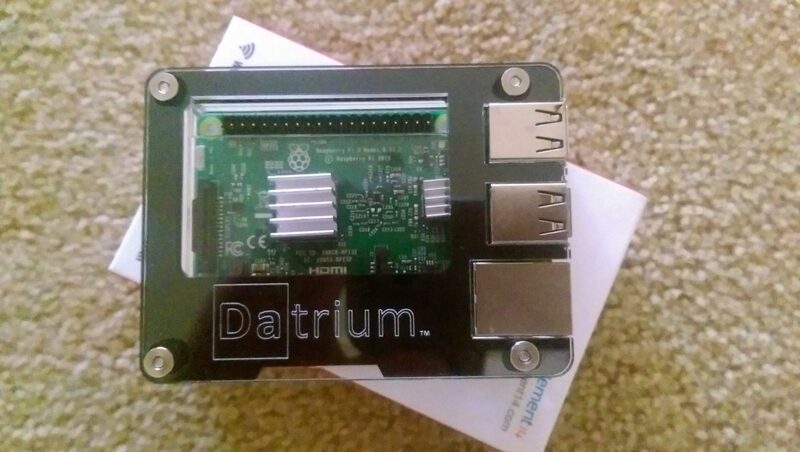 Datrium totally kicked it up a notch with a Raspberry Pi3 and awesome case. I also received a geek version of Cards Against Humanity from Solidfire and a medieval looking chalice from Catalogic and a nice baseball hat from Docker. We hit the Solutions Exchange a few times during the week to grab some extra stuff to bring back to our team. Hey we like to share! On Tuesday I had my first presentation of the week with Tom Cronin (@Virtual_Tom) and our TAM Joe DePasquale (@DePasqualeJoe). We spoke about meeting infrastructure high availability by deploying an out of band management cluster. The session went very well. I was a little nervous at the start, but once I got going, felt good. I was happy I went through my slides with no issues. Tom and Joe did a great job, we all did. Tuesday night we hit up another vendor party at the House of Blues, which was not nearly as good as the VMUG party and then headed to Ri Ra Irish Pub for vBacon Vegas Style. Hey it was beer and bacon, hell yeah it was fun! Wednesday was a pretty big day. My second presentation was with Hicham Mourad from VMware. We were presenting on vRealize Operations Capacity Management. The session had over 400 pre-registered attendees and ended up with over 300 showing up. This time I wasn’t nervous at all. I felt so comfortable on stage even though it was a much bigger room, stage and more people. I did the welcome and opening introductions then handed it off to Hicham to go into a technical review of capacity terms, badges and a demo, then back to me to share some specific slides on how we do capacity management at the bank. All during Hicham’s sections, I would interject with customer insight, and it worked really well. I had about 15 minutes of material to present at the end, and Hicham gave me about 8 minutes! lol. So I had to condense my info. Hicham and I killed it. We really did. We had a Top 10 presentation for Wednesday. Woo-Hoo! After the presentation because my time was short, I had a number of people come up to me with questions, and handed out my card for follow up. They were very interested in my experience with vROps at work. It was awesome, what a rush. It was like something clicked, I really enjoyed speaking in front of so many people and presenting to them my slides and information. It was such a thrill, I would do that full time! You can check out my session here. Top 10 Sessions at VMworld 2016 for Wednesday Look for vRealize Operations Capacity Explained. That’s me, killing it on stage with Hicham. Wednesday was also the VMUG Leader Lunch. They served us a nice meal, unfortunately I had to leave early for my presentation and didn’t get to stay for the speakers. Hopefully next year I wont have a conflict. One highlight is that I had a chance to meet VIRT. (@vmug_virt). Wednesday night was the VMworld party at the Las Vegas Motor Speedway. It was a super hot night, like 103 at the time of the party. That was the first time I experienced elbow sweat! The party was a lot of fun, food was good, lots of entertainment and I had a ride around the track in a car. Capital Cities opened for Fall out Boy. Both bands were great, but Capital Cities really was awesome. I always feel like I don’t have enough time to experience everything the party has to offer, but its always fun and its great that VMworld provides rides to and from the event. Hear are some additional photos from my trip. This entry was posted in VMWorld 2016 and tagged INF8097, MGT7924, VMworld, VMWorld 2016 on September 8, 2016 by Dan. This entry was posted in VMWorld 2016 and tagged VMworld on June 21, 2016 by Dan.